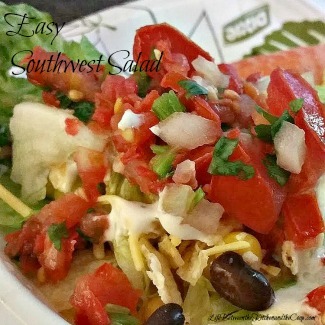 You can make easy southwest salad for a quick and easy meal. It’s a recipe that has a delicious combination of veggies, black beans, ranch dressing, and salsa. (I’m down with eating just about anything that has black beans and salsa!) It just bursts with southwest flavor! One of the best things about this salad is it’s a no-cook recipe. You get your protein without cooking meat! How awesome is that? Are you are still busy with preserving the food from your garden? No problem! At times like that when life is so busy, recipes like this one that can be thrown together in a jiffy so you can get other things done! You can either serve this yummy southwest salad in a big bowl or else just set everything out individually and let everyone make their own salad. 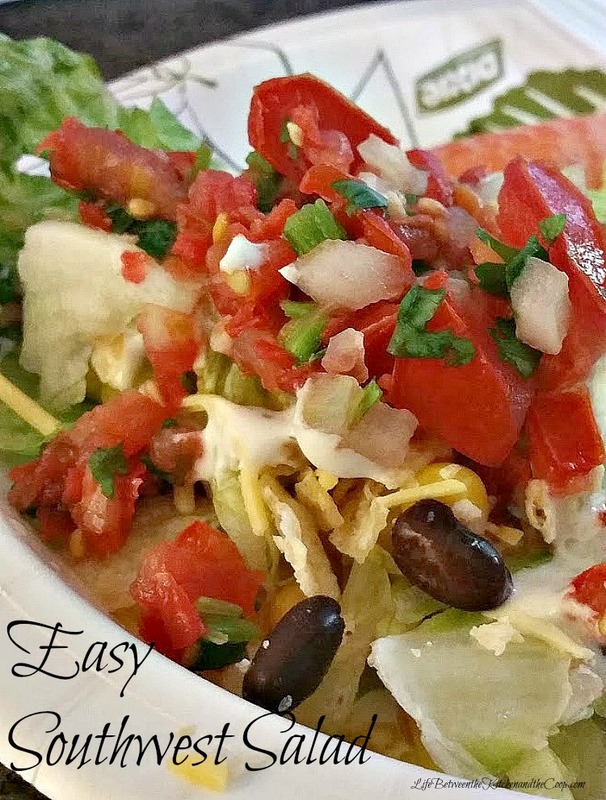 Layer the ingredients in the bowl: chopped lettuce, then drained corn and drained beans, then shredded cheese. Repeat layers until the bowl is full. Top the salad by sprinkling it with crushed up tortilla chips. Finally, drizzle your ranch dressing and salsa on it, then it’s time to eat! See how FAST that was? You can either serve it in a big bowl or else just set everything out individually and let everyone make their own salad. Layer the ingredients in the bowl: lettuce, then drained corn and drained beans, then shredded cheese. Repeat until the bowl is full. Top with crushed up tortilla chips. Finally, put on your ranch dressing and salsa, then eat! P.S. 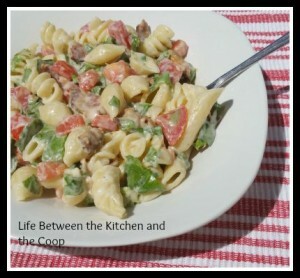 If you like salads, you will love this yummy BLT Summer Salad recipe! Next story Some Weight Loss Success! Thanks, Shamira! It was fun!